There should be military discounts. After all, there is nothing more heroic than serving in the American military. Thankfully, there are many places which don't just claim to support our military, but actually put their money with their mouths are (so to speak), offering active duty and retired military and their families, as well as veterans, discounts on entertainment and travel. So I've made this special page dedicated to helping military members find the discounts they deserve. Here's what I found. Here's a little "thank you" for veterans: Select B&B's nationwide are offering veterans a free night on Veteran's Day or Veteran's Day weekend. 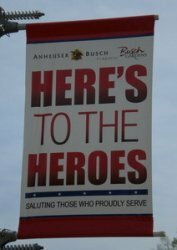 Go to www.BnBfinder.com (select "Specials" and then "Salute our Heroes" in the drop down box) for a complete list of inns and B&Bs in North America participating in the program. But you'd better do it quickly: the free rooms will fill up fast! And if you want to save a little extra, take advantage of free admission Veteran's Day Weekend at more than 100 national parks. Click here for details on what days you can get in National Parks for free. 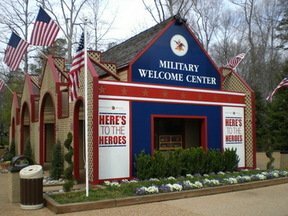 Busch Gardens Williamsburg - Veterans and up to three dependents get FREE one-day admission through their "Waves of Honor" Program mid-June through July 4. Tickets MUST be purchased ahead of time through this link. Active duty military members have access to the same deal (at the above link), as well as their new Military Pass, which provides free admission ALL YEAR (including Christmas Town) and free parking for $99. Details on that can be found here. 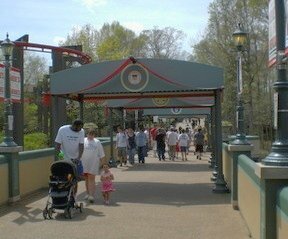 Kings Dominion - Active and retired members of the military get free admission on Military Appreciation Days (Memorial Day weekend and the July 4th weekend). The rest of the season, they can buy single-day tickets at a discounted rate (up to six tickets per ID; available at the gate only). The rest of the season, they offer a military discount that is currently $38.50 with military ID. Ski Resort Discounts - The great website militarybridge.com has detailed info on 25 ski resorts nationwide that offer significant discounts on lift tickets and more for military members. For the current list, go to militarybridge.com and type in "ski resorts" in the search bar. Virginia Beach's Virginia Aquarium - Active military (but not their families or guests) get 10% off combination tickets (admission + IMAX® movie) with military ID. Norfolk's Chrysler Museum of Art- Now the museum is always free to all visitors! From the end of May to the first week in September, the National Endowment for the Arts Blue Star Initiative offers military members and their families free admission at almost 900 science, history, and art museums nationwide. In Virginia, this includes Colonial Williamsburg, the Museum of the Confederacy in Richmond, the Virginia Museum of Fine Arts, and Thomas Jefferson's Poplar Forest. Just bring your Geneva Conventions Common Access Card (CAC) for active duty military personnel or a DD Form 1173 for active duty military family members. The military ID holder can get up to 5 family members in free on one card. For details and a list of participating museums in all 50 states and Washington, DC, go to www.arts.gov/bluestarmuseums. Wyndham Resorts military discount - http://www.wyndham.com and click on "special offers"
Florida Attractions military discount - http://www.wdwinfo.com and click on "discounts"
Get 10% military discounts on your listing at this site which specializes in military homes for sale or rent. I already mentioned the great site militarybridge.com. Check out their site to see a list of over 90 more places to get discounts on items like Yankee Candles, restaurants, theaters, and truck rentals.